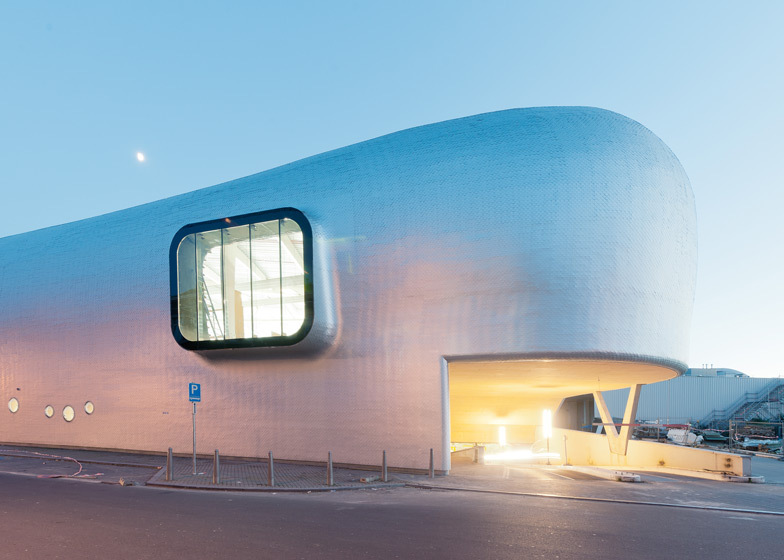 Shimmering aluminium skin and a gaping mouth give this ice rink in Belgium by architects L'Escaut the look of a whale (+ slideshow). 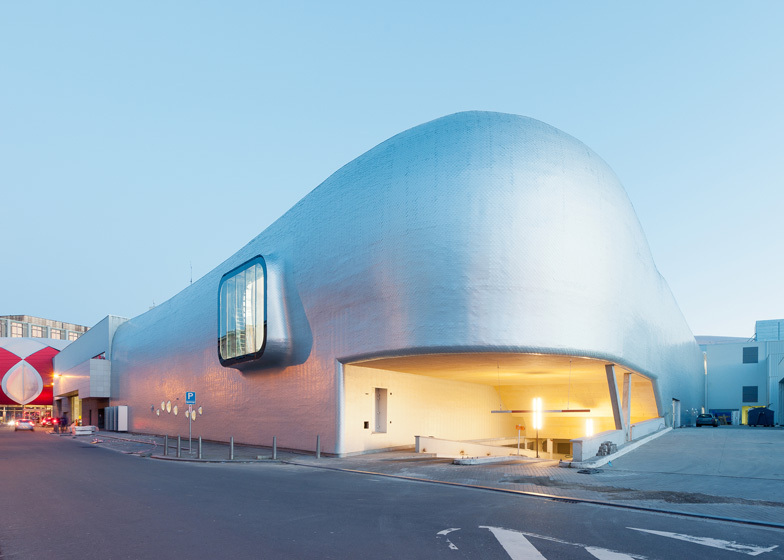 The architects describe their design as a "round, fluid and generous shape" that evolved to take the form of "a sea monster, a whale covered with 200,000 aluminum scales". 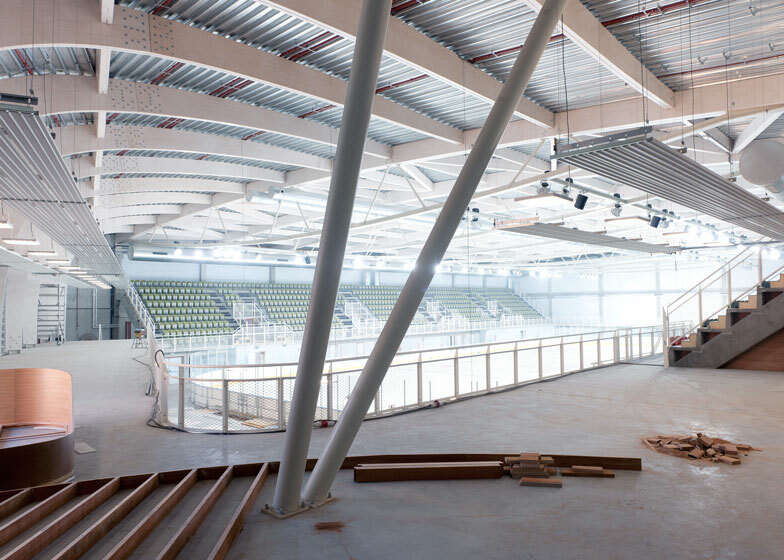 The ice rink is located in the city of Liège and forms the new wing of the recently constructed Médiacité shopping complex that sits beside the river in Longdoz. 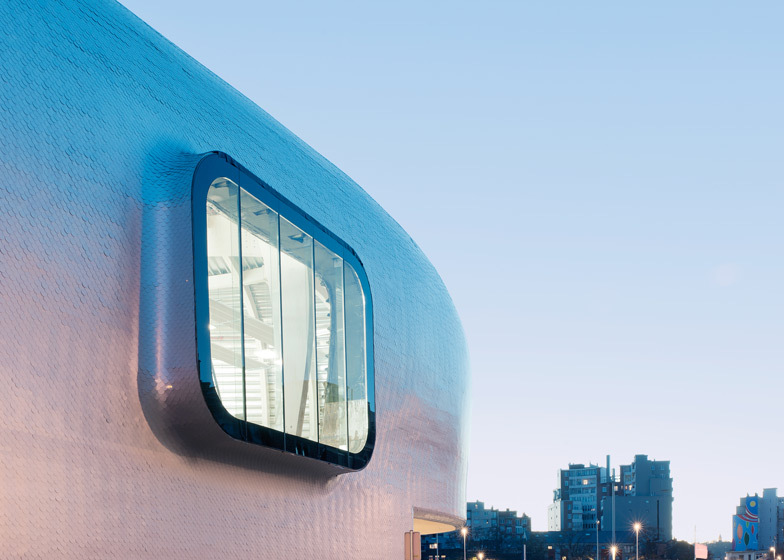 A protruding window with softly curving edges gives the whale a large eye, while the open mouth provides an entrance for cars to the parking area below the building. The pedestrian entrance to the ice rink is located within the shopping centre and there are no additional windows, aside from a few small portholes along one edge. 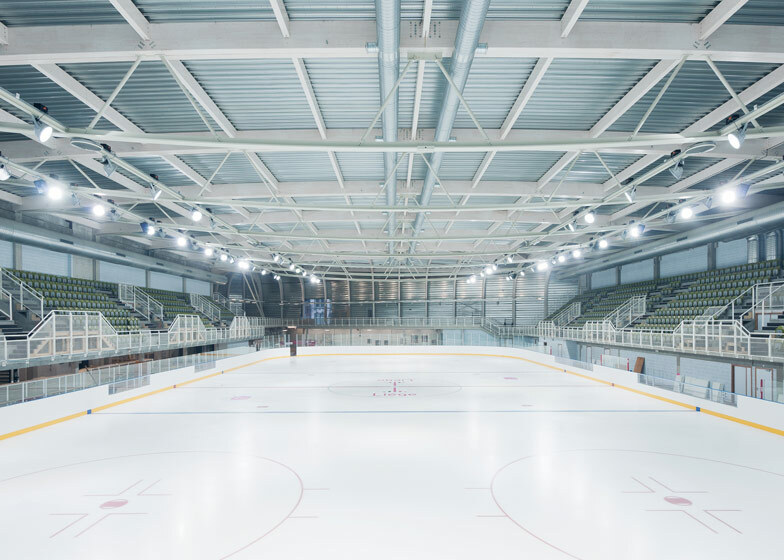 The 1200-spectator ice rink fills the interior of the building and is large enough to host international competitions in speed skating, ice hockey and figure skating. 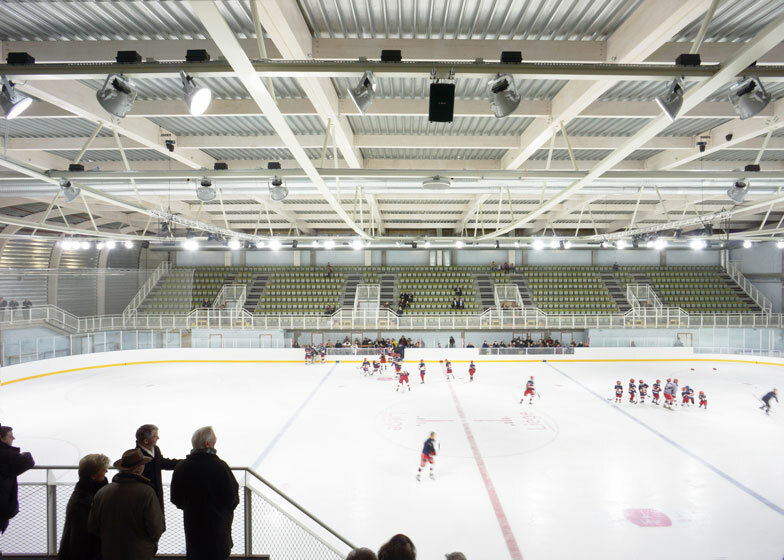 Recycled seating furnishes the arena and was salvaged from the interior of an ice rink, just a short drive away in Coronmeuse. Glue-laminated timber beams and joists give the structure its curved profile and wrap around a recreation room and cafe on the edge of the rink. Brussels studio L'Escaut designed the building in collabotarion with local architects BE Weinand. Whales have provided the inspiration for a number of designs in recent years, including a flying hotel proposed in France and a whale-shaped cultural complex in Hungary. We also recently featured a staircase concept inspired by a whale's spine. Photography is by Marc Detiffe. At the root of the project: a round, fluid and generous shape, as a metaphor of a universe of ice. As its construction progressed: a sea monster, a whale covered with 200,000 aluminum scales. The new ice rink of Liège is embedded into a crevice of the Médiacité, private real estate development project which came to redevelop a former industrial site on the right bank of the Meuse. It inherits several constraints that it clarifies in an autonomous and unitary form, until incorporating the access to the mall's car park in its climax: the whale's head. As the opacity of the building is essential to insulate it from the heat, it is its entire body, by its nature, its material and its shape that means the relational dimension it wants to maintain with its environment. Moreover, the composition of its outer shell (on the mass-spring-mass principle) achieves a noise attenuation of 50db and protects the residents of the adjacent street. Apart from a succession of portholes to the street sidewalk that suggest the activity of the strange object, the only transparent opening in the façade, is this bay as big as an antechamber that realizes a frank and larger indoor/outdoor contact. On the one hand, the public building is integrated into the multitude of store names of the mall, as the main entrance is located at the "gallery" side. On the other hand, through its secondary entrance, it is inserted at the back of the service street of the shopping centre, giving a more positive urban value to this dead end. This "public mammal", stranded behind a scene dedicated to consumers, plays with the shimmering of its metal skin and the glare of its white interior to attract citizens and encourage them to skate. The main access to the car park of the mall is located at the only "end cap", identity pointer of the rink. This dome is the most curved and spectacular area of the façade, where the careful scheme of the scales is revealed. This volume rises gently to allow cars to go. A load bearing element straight out of the 70’s reminds us of the glorious past of Liège, a time when car was queen in town planning as in some architectural projects (residence Simenon and its included petrol station, residence Belvedere with its architectural ramp). Today, it is no longer welcome, but it is still omnipresent in the city. Why should we deny it? Let us honor it by adding the atmosphere of New York in the 20’s and its "diners". 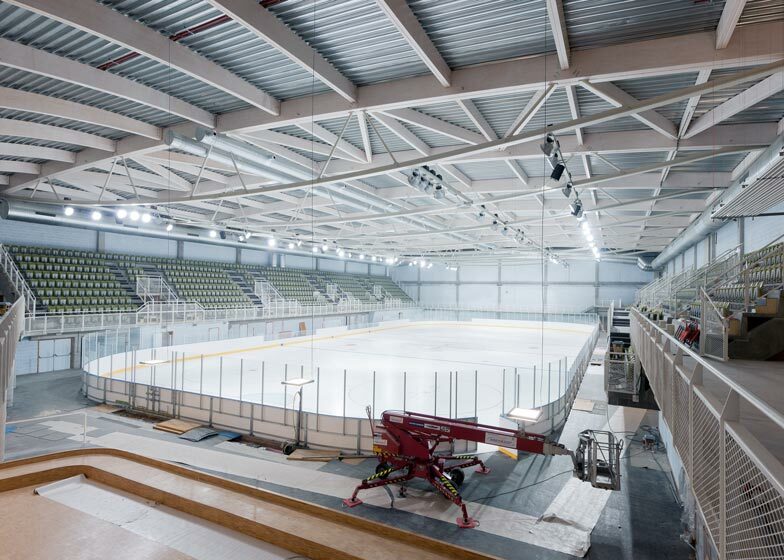 The interior space of the rink focuses on the heart of the matter: functionality, economy and pleasure. In the Médiacité, at the entrance to the ice rink, a white light shower of 1000 lux indicates the direction of the world of ice. Once past the airlock chamber, we dive into an ambient temperature of 16 ° C all year round. Upon arrival in the foyer, the whole rink and volume of the building is visible through a transparent metal wall. Here you can sometimes have a hint at amateurs, sometimes hockey teams or figure skaters. The skating area is directly accessible from the foyer. We get our skates, pull them on and are ready to slide! The "wood room" adjacent to the rink is a recreation room with a solid oak flooring. One can enjoy Liège waffles, perhaps even Lacquemants in October? As visitors, walking along the metal wall until the end, we are reaching the first floor and its cafeteria. On the way, by looking through the mesh, the kinetics of storage is shown: skate drying and sharpening. While climbing the stairs, we discover the dome and a large window with rounded edges, and finally the carcass of a marine mammal... Ah yes, the whale! If we're coming by car, we quickly identify that it is the glued laminated timber structure completely laid bare before our eyes that creates the strange shape previously penetrated. Are we inside the Venturi's duck?... The scales ratio is therefore increased tenfold. Just a quarter turn to the right and the rink, surrounded with its 1200 seats, presents itself to our eyes. The inhabitants of Liège will recognize the seats of the former ice rink from Coronmeuse, hosted in the "Grand Palais des fêtes", built for the Universal Exhibition of 1939. During events, the cafeteria is transformed into a XXL taproom, integrating the walkway along the façade that merges with the rink volume: the domestic scale of the bar is then confronted with the massiveness and the emotion of a hockey match or a figure skating gala. 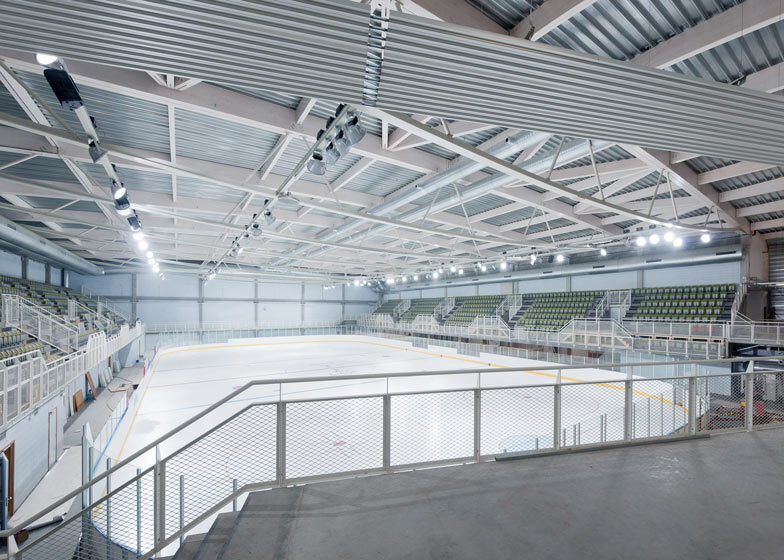 The pleasure of the skater, the player, the spectator and the visitor is made for by the space, but also by the performance of this tool: an outer shell with an insulation factor of K22, equivalent to a passive house; 2 refrigeration units developing 1000kW coupled with 4 sets of air coolers; a ventilation system of the room with a flow rate of 60,000 m3/h for dehumidifying the air of the rink; 80 spotlights ensuring a perfect homogeneity of 1200 lux during matches and competitions, particularly when broadcasted. Formidable engineering was necessary to allow this sea monster to perform at a high level, but also to reuse consumed energy: heat pump, ventilation system and hot water tank recovering a part of the heat produced by the refrigeration units, a piping system as a Tichelmann loop to better distribute the cooling liquid under the rink and thus consume less. During the preliminary studies, a connection to the heating system of the shopping centre was also considered to carry away part of the generated heat. It can still be done later if the centre wishes. Program: Olympic ice rink with 1200 seats /1800 skaters on ice.